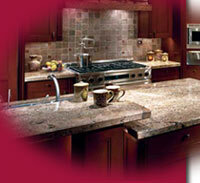 Granite is a product of nature and is known for exotic colors, granite is scratch resistant and heat resistant. The beautiful natural stone you choose will be unique to your kitchen only. Visit Tutto Marmo to view all your granite choices. Manufactured Stone is not only consistent in color, but offers durability. Being 93% quartz 7% resin, manufactured stone is scratch resistant, heat resistant, and stain resistant. With quartz you have the beauty of stone without the maintenance. Pick out the wide range of color from Caesar Stone® and TechniStone®. With the option of a virtually seamless counter, solid surface offers integrated sinks and coved back splash. Solid surface provides a practical workspace that can be kept sparkling, appealing and sanitary with minimal maintenance. Choose from all the colors Corian® and Meganite® has to offer. Laminate has 1,000s of colors to choose from and is very cost effective as well. Choose from matte to sparkling finishes that will give your kitchen character. Pick from Wilsonart and Formica® colors that fits your kitchen. Using tile counter tops, you have the flexibility to create your own masterpiece. There are many types of tiles you can use such as, slate, ceramic, and granite.